These businesses provide specialized clothing appropriate for Alaska outdoor activities. 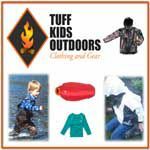 Parkas, jackets, bibs, insulated pants, and gear bags designed, proven and tested in Alaska. Camouflage clothing, huntng and camping gear, military and law enforcement uniforms. Thousands of products at surplus prices. Large selection of hunting boots and waders in all sizes. Free shipping and no tax. Swazi Apparel specializes in making the world's most durable hunting clothing. Products include a super quiet Gore-Tex that works exceptionally well in SE Alaska! Check out our website.